One or the worst things that could happen is experiencing a painful, throbbing toothache. When this happens something you may not be aware of is that the little things you’re doing ( or not doing ) could be contributing to a more severe sensation of pain. For that reason we highly recommend you think about some positive ways to help lessen your pain and move towards a solution. 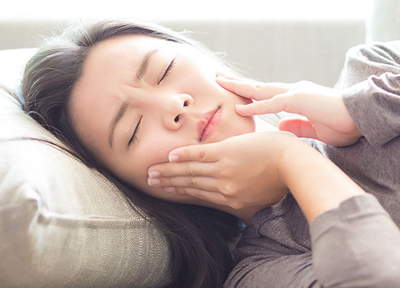 You Touch It Too Much – It’s natural to touch any place that is causing us so much pain and discomfort but do you know you can easily aggravate the toothache by touching the area. You might find you will be better off if you don’t press on it with your tongue, touch it with your fingers, over brush or over floss around the tooth etc. Just clean the tooth as usual and leave it alone to prevent aggravating the situation further. You haven’t contacted your Surrey dentist – A surprising fact is that dentists often hear that after a patient with a toothache contact the dentist their pain magically subside a bit. The reason behind this is that feeling stressed and anxious can magnify a person’s discomfort. By taking action and scheduling a dental appointment it allows the dentist to find what’s causing your toothache which reassures you that pain relief is near. So remember to avoid delaying that call to the dentist anytime you experience a toothache. Your airplane ride – If you’re travelling in the near future by airplane any areas of concern are going to cause increased discomfort during your flight. When you have some concerns about toothache pain it’s wise to book an appointment with your dentist to avoid any pain from troublesome teeth that could increase when flying. Dental checkups can be something we have a tendency to postpone. Experiencing the inconvenience of a toothache is one reason to see your dentist regularly to avoid this happening to you. Contact us at Elgin Corners Dental now to set up an appointment for a complete checkup.